The term York Rite is a term most often used in the United States of America to refer to a collection of Masonic degrees that, in most other countries, are conferred separately. As such, it constitutes one of the two main branches of Masonic Appendant Bodies in United States Freemasonry, which a Master Mason may join to further his knowledge of Freemasonry. 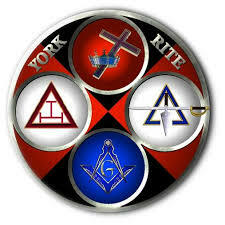 Its name is derived from the city of York, where, according to a Masonic legend, the first meetings of Masons in England took place, although only the lectures of the York Rite College make reference to that legend. The divisions within the York Rite and the requirements for membership differ from jurisdiction to jurisdiction, but the essentials are the same. In all the workings, the one requirement is that all applicants be in possession of the degree of Master Mason (the third degree of Freemasonry). The Ancient and Accepted Scottish Rite of Freemasonry commonly known as simply the Scottish Rite, is one of several Rites of the worldwide fraternity known as Freemasonry. 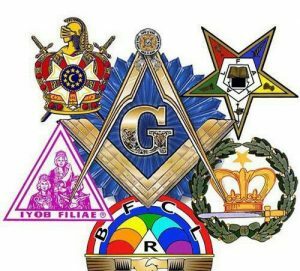 A Rite is a series of progressive degrees that are conferred by various Masonic organizations or bodies, each of which operates under the control of its own central authority. In the Scottish Rite the central authority is called a Supreme Council. 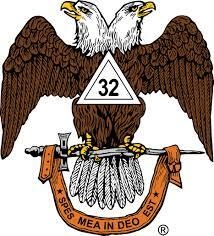 The thirty-three degrees of the Scottish Rite are conferred by several controlling bodies. The first of these is the Craft Lodge which confers the Entered Apprentice, Fellowcraft, and Master Mason degrees. Craft lodges operate under the authority of Grand Lodges, not the Scottish Rite. The Scottish Rite is one of the appendant bodies of Freemasonry that a Master Mason may join for further exposure to the principles of Freemasonry. In England and some other countries, while the Scottish Rite is not accorded official recognition by the Grand Lodge, there is no prohibition against a Freemason electing to join it. In the United States, however, the Scottish Rite is officially recognized by Grand Lodges as an extension of the degrees of Freemasonry. The Scottish Rite builds upon the ethical teachings and philosophy offered in the craft lodge, or Blue Lodge, through presentation of the individual degrees. 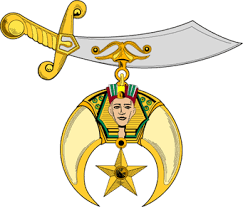 The Order of the Eastern Star is the largest fraternal organization in the world that both men and women can join. It was established in 1850 by Rob Morris, a lawyer and educator from Boston, Massachusetts, who had been an official with the Freemasons. It is based on teachings from the Bible, but is open to people of all monotheistic faiths. It has approximately 10,000 chapters in twenty countries and approximately one million members under its General Grand Chapter. Members of the Order are aged 18 and older; men must be Master Masons and women must have specific relationships with Masons. Originally, a woman would have to be the daughter, widow, wife, sister, or mother of a master Mason, but the Order now allows other relatives as well as allowing Rainbow Girls, Triangle Girls, and Job’s Daughters to become members when they become of age. Order of the Amaranth is a Masonic-affiliated women’s organization founded in 1873. 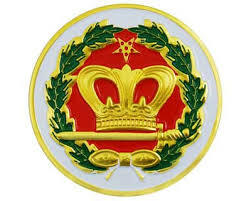 As in the Order of the Eastern Star, members of the Order must be age 18 and older; men must be Master Masons; and women must be related to Masons as wives, mothers, daughters, widows, sisters, nieces, aunts, et cetera, or have been active members of the International Order of the Rainbow for Girls or Job’s Daughters International for more than three years and be recommended by a Master Mason. Amaranth was based on Queen Christina of Sweden’s court. Christina had created the “Order of the Amarantha” for the ladies and knights of her court. In 1860, James B. Taylor of Newark, New Jersey drew upon this order to create a new fraternal society. In the Order’s teachings, the members are emphatically reminded of their duties to God, to their country and to their fellow beings. They are urged to portray, by precept and example, their belief in the “Golden Rule” and by conforming to the virtues inherent in TRUTH, FAITH, WISDOM and CHARITY they can prove to others the goodness promulgated by the Order. Amaranth is organized into Courts, under Grand Courts at the State level. The primary body is called the Supreme Council. Women members of the Order are addressed as “Honored Lady”, while men are referred to as “Sir Knight”. 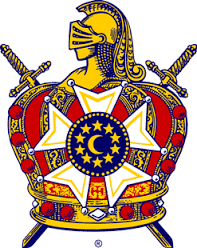 Founded by a Freemason, DeMolay is closely modeled after Freemasonry. It is not directly connected to Freemasonry, though it normally meets in a Masonic Lodge room. DeMolay is considered to be part of the Masonic Family, along with other youth groups like Job’s Daughters and the Rainbow Girls. Like the Rainbow Girls, a young man does not need to have a family tie or sponsor in a Masonic organization to join DeMolay. 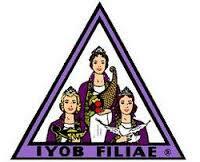 Job’s Daughters International is a Masonic sponsored youth organization for girls aged 10 to 20. The organization is commonly referred to as simply Job’s Daughters or Jobies, and is sometimes abbreviated and referred to as JDI (or IOJD, the original initialism). Job’s daughters is focused on the Holy Bible but celebrates and welcomes many religions and cultures. The individual chapter is called a Bethel, and each is numbered sequentially according to when they were instituted in their jurisdiction. They usually meet at a Masonic Lodge building and when they are in session they refer to the meeting place as the Bethel room. 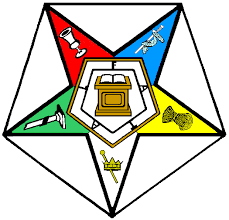 The International Order of the Rainbow for Girls (IORG) is a Masonic youth service organization which teaches leadership training through community service. Girls (ages 11-20/21) learn about the value of charity and service through their work and involvement with their annual local and Grand (state or country) service projects. Shriners International support Shriners Hospitals for Children, a one-of-a-kind international health care system of 22 hospitals dedicated to improving the lives of children by providing specialty pediatric care, innovative research and outstanding teaching programs. Since 1922, Shriners Hospitals for Children have significantly improved the lives of more than 865,000 children.